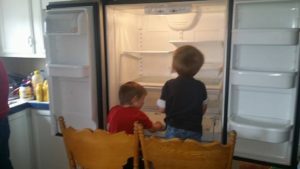 My super, sneaky, secret way to clean a Refrigerator. I have discovered the easiest and a fun way to clean. First, I empty everything out. Then I take out the shelves carefully place them on the back lawn and spray them down with the garden hose. This is the fun part as me and my son spray the shelves and each other. The sneaky part is to pull the chairs up to the refrigerator and arm your helpers with a hot soapy dish cloth and wipe the insides down. Happy cleaning!